Want to be the coolest boss AND want your employees to learn to work better as a team? 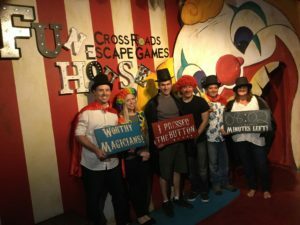 An Escape Room is the perfect choice! 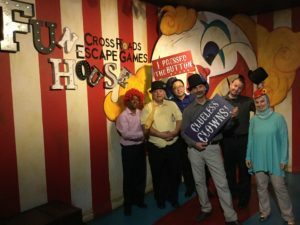 In an escape game, players must work together, communicate, and think outside the box in order to overcome the obstacles while having fun and working under pressure. 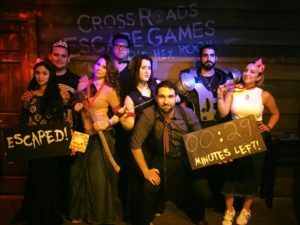 Along with this fun real life adventure game, we are one of the only escape games to offer an exclusive private space after the game for players to talk about their experience. -Richard O., President of Cooper Floors Inc.
We currently have 3 games to choose from. The Hex Room is our horror themed game for 5-10 players. The group will be divided into different rooms where they have individual tasks they must complete. Although the group is physically divided, there are obstacles along the way that must be overcome as a team. The Fun House is our less stressful wacky circus game for 4-8 players and is great for beginners. This game will have all the players together the entire time, sharing and working together to escape. The Psych Ward is a game of trust, betrayal, and deduction for 5-8 players. The group will be divided into two teams, and they must figure out who to trust. Our game maximums are very strict. The phrase “too many cooks in the kitchen” is a perfect example. When there are too many players in a game, communication starts to break down, people get confused, left out, and frustrated. In order for your team to have the experience it deserves, we have a maximum number of participants allowed inside a game at once. 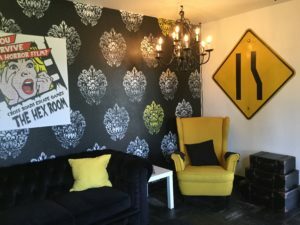 If you have a larger group, we are able to accommodate groups up to 26 at once split into two games (10 in Hex Room, 8 in Fun House, and 8 in Psych Ward). We can still accommodate groups larger than 26, but they would have to be spread out into different time slots. More information on accommodating a large group can be provided upon request. Price per person: Ranges from $32-$35 per person depending on date. Larger groups of over 20 people may qualify for a discount but it excludes Friday, Saturday, and Sunday games. After the game, players will get to sit down in our private lounge and talk with one another about their experience. The lounge comfortably holds 12 maximum. Catering is permitted with the rental of our private lounge. If you would like food at your party, it is the guests responsibility to order and arrange any catering services. We recommend: Pepz Pizza, Mendocino Farms, Panera Bread, or Olive Garden. For more information or to make a booking, please call us at (714) 572-1004.